Ubud is a far cry from the packed beaches of Bali’s south coast, which have a faint whiff of Miami beach or Australia’s Gold coast. The town is at the island’s cultural heart: think temples, rice paddies and stone carvings rather than surf and sunburn. Tourists have sought out its charms for generations. First, it was artists drawn by the town’s rich Hindu art traditions. Then came a bohemian crowd with some famous names like Noel Coward and Charlie Chaplin among their ranks. Later came hippies and then mainstream tourists. Hordes of them. Tourism has brought rapid economic development to Ubud. The town only received electricity in the 1970s, when Bali had about 100,000 foreign visitors a year. This year the island will host nearly five million foreign visitors, and Ubud itself has more than 400 hotels to cater to the masses. But a quick trip to the areas that surround the town reveals a Bali that hasn’t changed quite so much. 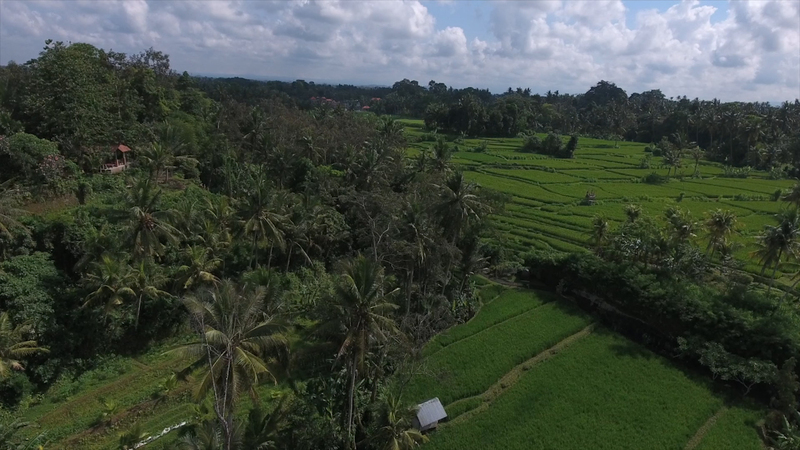 When the rice is almost ready to harvest, Ubud is surrounded by tranquil fields of green, gently undulating in the breeze. It’s easy to forget that all this beauty is built on backbreaking labour. But economic progress is bringing a new kind of work to town. A very different kind of workforce has moved in. Interspersed between the temples and the tourists, there’s a group of professionals – most of them young and from the West – who live and work remotely from here. These digital nomads are drawn by the warm weather and beautiful surroundings. The cheap rent doesn’t hurt either. “I don’t see why we have to get stuck in that cycle,” says Gert Schreuder, a South African software developer who expects to be here for at least a year. Even before he left home, he worked remotely. But it occurred to him one day that he could do it from anywhere. He says he’s more efficient when his time is his own. The ability to take the morning off to go to the beach or to do yoga actually makes him more productive. “At least when I get back, I’m going to be clearheaded, and focused, as opposed to being this unproductive little robot zombie, where I have to be there, but I don’t feel like I’m going to achieve what I have to do,” he says. Although lower costs appeal to many digital nomads, Schreuder says living here costs roughly the same as in his native Cape Town. He’s mostly here for the lifestyle: the people are very friendly, he says, and the hills and the seaside remind him of home, only with better weather. But that doesn’t mean that everything’s perfect. It’s a transient population, which means friends tend to move on. A remote office means taking work phone calls at odd hours. There are also the mundane challenges of living in a developing country. He has a huge scar healing on his leg from a scooter accident, something that’s so common in Asia that insurance policies won’t cover it. Monkeys, however, rarely interfere with business, even though he works out of a co-working space across the road from the town’s famous Monkey Forest. It’s difficult to know exactly how many digital nomads work from Ubud. Transient populations are hard to count, and immigration statistics don’t help, because most digital nomads here are on rolling 60-day business visas, lumping them in with those here on short business trips. And besides, there’s no agreed definition. Does someone who brings their laptop on a weekend trip from Singapore count, or does it require more commitment? But even if nobody’s counting, the market that serves them suggests their numbers are growing. In addition to two large co-working spaces in Ubud, there are ten others across the island. They simply didn’t exist a decade ago. It’s part of a larger global trend. Self-employment in the UK increased from 3.8 million in 2008 to 4.6 million in 2015, while a recent study found roughly a third of the US workforce are now freelancers (although others have disputed the claim). US research firm Gallup found that from 2012 to 2016, the number of employees who work remotely at least some of the time grew from 39% to 43%, and employees working remotely spent more time doing so. Cheaper airfares and better connectivity are making it possible to do it from much further away. While many say the lifestyle makes them more productive, it’s not for everyone. For some digital nomads, the working holiday is heavily slanted in favour of the holiday. There are plenty of distractions here. There are a few people who just don’t have the discipline. “The worst thing that can happen is that someone comes here and has a two-week vacation,” says David Abraham from Outpost Ubud, a co-working space. After all, these are people who already have jobs and clients. In many cases, they’re freelancers, which requires an entrepreneurial streak in addition to skills and a willingness to work. Tom Hickman has been here for three years. He says many people have a hard time concentrating on their work. He struggled too when he first arrived here. “It’s like a marriage. Most people say there’s a three-month honeymoon period where the novelty, the newness and the new people and the whole thing are really intoxicating. But then after the honeymoon wears off, you’ve got to do the washing up, and pick up the boxer shorts off the floor,” he says. Daniel Kristiyanto is an Indonesian data scientist who has just arrived in Ubud after spending several years in Seattle. He returned to Indonesia after a several years working and studying in the US. He’s enjoying it so far. “I feel a lot more recharged here, and I get a lot more things done, despite all the challenges,” he says. He never really understood why his American friends were so intrigued by the town. He always knew Ubud was a tourist bubble that catered to Westerners. Even so, he was a little surprised at how hard it was to find some of his favourite Indonesian dishes in local restaurants. It was too difficult for him to work from his home town in Central Java, because the internet was patchy. The other possibility was Jakarta, but its traffic-choked streets didn’t really appeal. He’s in a specialised field, and he doesn’t think he’ll be here forever. And there is a cost to being so far away from the office. He says he’s missing out on professional development and networking opportunities that he would have had if he had stayed in Seattle. “The tradeoff with being here is that I [have] lost touch with that kind of community. I feel left out,” he says. Ubud is the perfect place for digital nomads in many ways. It’s a genuinely interesting and engaging place with infrastructure that’s good enough for remote workers to get their jobs done. It’s considerably more expensive than Denpasar, which is just up the road. It’s also a lot more pleasant, and it’s affordable for most people on a Western salary. The website nomadlist, which tracks expenses and facilities in various cities for digital nomads, says Ubud costs a little over $1,000 a month. That’s about half as expensive as most second-tier European or US cities, and less than a third of living costs in New York. It’s a comfortable lifestyle, but in some ways it’s difficult to escape. Many admit that it’s hard to break out of the expat bubble. Being next to a culture is not the same as understanding it. Hindu ceremonies never stop here. Temples are constantly decorated for weddings or religious festivals. Throughout town, there are smiling women sitting on steps, folding palm leaves into canang sari, the small baskets that are filled with flowers and offered at shrines. The Balinese are used to Westerners, who have been visiting for generations. It’s a friendly place by any standard. But a certain amount of unease is evident from signs at the temple doors, helpfully written in English, that instruct Westerners to dress respectfully. Most locals have a vastly different working life to the digital nomad tribe. Some Indonesians work alongside Westerners in the town’s co-working spaces. Then there are those who rely on the tourist dollar to make their living. Ubud is home to more taxi and scooter drivers, massage parlours and tour guides than seems possible for a town of its size. Tourism has brought fancy hotels and western brands like Starbucks. And the local “artisanal butcher” wouldn’t be out of place in Brooklyn. Ubud is certainly not undiscovered country. But just outside town, things are different. The region’s charms are more bucolic and traditional. There are farmers, small shopkeepers and a surprising number of stonecutters, who chip away at the soft volcanic rock, supplying the town’s temples and creating a few curiosities along the way. There’s something ironic about being a digital nomad: these are people who move half a world away for a change, but end up with a lifestyle that’s all too familiar. Very few trade in the laptop and the phone for other tools. They’re inundated with late-night calls from company headquarters. And instead of venturing out into the rice paddies, they spend all day sitting in a co-working space that’s not too different from their office back home. For some, it’s seems less like freedom than a longer leash. Plenty of travellers arrive seeking spiritual healing in addition to a new place to work. And Ubud has plenty to appeal to anyone who can keep a straight face while someone talks about crystals or their aura. The latest generation of digital nomads seems less spiritually inclined than the guru-seekers who came before them. But they’re happy to buy into the mainstream, commodified 21st Century version: smoothies, meditation and yoga classes. The trip here seems to often follow a relationship breakup or a retrenchment. Most come seeking change or personal development. None of them will tell you they came here because they can work next to a pool and afford a maid. Even so, escaping London or Singapore rents seems like an incredible luxury. “The critique, and the self-critique of this lifestyle is that we’re using our economic privileges in a culturally insensitive way. But of course, it’s not as simple as that. We’re also bringing economic development and other things like that,” says Tom Hickman. It’s a double-edged sword. There’s no doubt that tourism and digital nomads provide jobs and bring in plenty of money. On the other hand, tourists have made Ubud one of Indonesia’s most expensive towns, and digital nomads are likely adding to the cost too. Far fewer locals have the option of flying somewhere cheaper.